Cast your bucket down the well of wonders and see what prizes that it throws up. 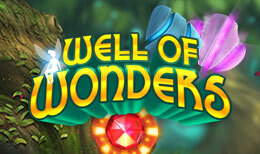 Well of Wonders is a beautifully animated online slot game set in an enchanted forest. In addition to its contemporary graphics this game has a floating gameboard that are filled with colourful emblems for you to match up and increase your prizes. Spin today and have the will of the fairies on your side. You can also see our homepage for more info. Founded in 2012, Thunderkick is a new company full of fresh and innovative ideas. Their team comes with years of experience in the online gambling and gaming industry. Truly passionate about what they do, all their games and platforms are done in house, and aim to put forward quality ahead of quantity. Thunderkick take full advantage of the latest state of the art technology and use real-time 3D graphics in their games, delivering quirky, funny and entertaining slots that you won’t find anywhere else. Moving with the times they are now concentrating on providing mobile and social online slot games making them a brand worth looking out for. Make a wish and cast your coin into the Well of Wonders to see if all of your dreams will come true. This unique online slot game from Thunderkick features 7 symbol positions, all of which are in play when determining your winning total. All you have to do is land 3 or more of the same symbol anywhere on the screen and you’ve won! It’s as easy as that. You also have some additional features in this enchanted themed game. To help you realise your dreams you have the Re-Spins, Wilds, Multipliers and a Fairy Feature. Before you start playing this beautifully textured slot game, you will need to set your bets. Click on the ‘Number Coin’ button, and a separate panel will open up. From there you can set your bet ranges from 1p up to £100 per spin. You also have an Autoplay option which will allow you to set everything and the reels will spin automatically without interruption. The Wild symbol is the dark blue stone symbol with a W carved into it. This symbol will substitute for all other symbols when determining winning combinations. Multipliers are set at the foot of the Well; each multiplier has an individual stone. Multipliers go as follows, x1, x2, x4, x8, x16 and x32. When a winning combination is made it is paid at a current active multiplier, this multiplier will increase with each win up to the maximum multiplier. After winnings are paid out, all symbols in the winning combinations are removed and new symbols explode forth from the depths of the Wishing Well providing you with new chances to win again. Once they’re there they will float about your screen, there are no reels in this innovative game. When the symbols are floating in mid-air, they will begin to rotate. If you don’t match any of the symbols, they’ll be removed and you play again. A Fairy symbol can appear on any spin at any time, and when it does it will trigger the Fairy Feature. When the Fairy is present and there is no winning combination, the Fairy gets activated. All symbols that appear in a singular will be removed, giving a respin and a multiplier increase. This online slot game is beautifully rendered with a stunningly magical theme. Thunderkick has moved away from the traditional reel-grid online slot game with the unique set up of this online slot game. It’s straightforward and easy to master, with innovative and beautiful game play it is sure to please everyone. Want to try another slot game? Read more and play Zoom.